Some of the Best Irish Tours are Walking Tours! Daniela and I think that some of the best Irish tours are those that involve walking. You not only get needed exercise, but you can take in the wonderful scenery at a slow and leisurely pace, really experiencing the natural beauty and wonder Mother Nature has to offer. Ireland is great for walking; the scenery is beautiful, but it's also cool, so you can walk for hours and not feel too hot. Of course in July, August and September the summer temperatures do make it a little warm, but overall it's quite comfortable. These are some of the best Irish tours we've been on. 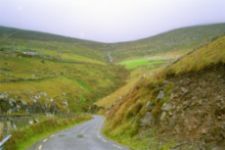 Definitely one of the most scenic areas in Ireland, if not the world, the Dingle Peninsula is home to many historic archaeological sites from the The Dunbeg Promontory Fort dated back to 800 BC to the unique Gallarus Oratory, and makes for one of the most interesting and scenic of Irish tours. Relics from the Bronze and Stone Ages as well as the Celtic Period abound, and because of its somewhat isolated location, these relics are most remarkably preserved. For the Ecclesiastical minded, the ruins of ancient monastaries, oratories and shrines are evrywhere, and one can't help but be enveloped by the spiritual aura that Dingle exudes. The absolute best way to experience these wonderful attractions, the flowers, fauna, scenery and atmosphere that encompasses Dingle, is to set out on its many walking trails. The best known is The Dingle Way which stretches for 112 miles beginning at Blennerville, just outside Tralee and finishing at Slea Head. "The Way" is well marked by signs and wends its way across beaches, over hills and dales and besides beautiful and awe-inspiring cliffs, leaving one both amazed and eternally fulfilled. There are also cycling and horseback riding excursions available. Are these Irish tours Kid-friendly? Absolutely, there are plenty of fun things for them in the Dingle area also! If they are toddlers you can drop them off for the day at a wonderfully equipped and organized day care center. 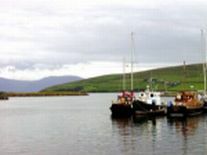 For older kids there is an abundance of activities from sailing and horseriding lessons to pet farms and Oceanworld Aquarium, to the World of Leisure Fun Center, and finally the star attraction of Dingle, Fungi the dolphin, a solitary male dolphin that has befriended the inhabitants of Dingle and made it his home! Accomodation in Dingle is available whether you like the intimate atmosphere of a Bed & Breakfast, the luxury and comfort of a Hotel, or the privacy of a self catering unit. 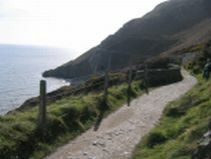 For a leisurely and relatively short walk the Bray Head delivers spiritual elation and mesmerizing scenery. 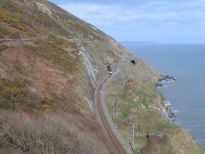 This Irish tour around Bray Head takes you from the seaside resort of Bray to the neighboring town of Greystones from where you can continue on the famous Irish Film Trail. The walk is approximately 6 miles long and should take the average walker about 2 and a half hours. You will want to take your time as the views offered from the seaside cliffs are fabulous! You can start your walk at the Bray DART station. When you leave the station make a left and head down between the country lanes lined with souvenir shops, fast food and gaming dens to the promenade which stretches right to Bray Head, you can't miss it. If you like first visit the National Sea Life Center with over 24 spectacular displays. After, head up the hill and to the left which will take you right to the beginning of the cliff walk and from there, all the way to Greystones. As I mentioned the views are spectacular and the flora and fauna decorate the way with brilliant color. You can also see the DART chugging along below you, and the kids will love watching the trains as they ramble along the cliffside tracks and through the tunnels! On arrival you'll find that Greystones is a small town and makes for a pleasant stroll with its tree lined avenues and relaxed atmosphere. Plenty of unique shops, pubs and restaurants will provide you with an easy afternoon of unwinding before you hop back on board the DART. This is one of the most enjoyable and economical Irish tours we have been on. Glendalough (Glen of Two Lakes) is both a walker's and nature lover's paradise, and one of the Irish tours noone should miss! 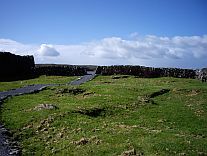 The site of a monastic settlement founded by St. Kevin in the 6th. century which grew to be one of the major learning centers in Europe, Glendalough is situated in the Wicklow Mountains National Park. The remnants of the settlement today consist of its famous round tower, the cathedral and graveyard and other buildings dating back to between the 8th and 12th centuries. There are nine different walks to choose from in Glendalough ranging from 1.7km. to 11km. and each has its own unique countenance, from the Poulanass Trail which takes you up to and under the Poulanass Waterfall to the Derrybawn Woodland Trail where one can spot Red Squirrels, numerous birds and beautiful fauna. We recommend that if you want to explore and really appreciate Glendalough you stay for an entire day or too. A day trip will simply not give you enough time to enjoy even a fraction of what it has to offer. There are lots of Bed and Breakfasts, hostels and hotels in the area, the most convenient being the Glendalough Hotel, located right in the valley itself. They often offer special packages and you can get 3 night packages for around €150 per person including breakfast and one or two evening meals. This is one of the most scenic Irish tours we've been on, courtesy of a day tour from Limerick by Barrets Tours, owned and operated by Richard Barret and his wife Chris. The Barrets are originally from England, came to Ireland about 10 years ago and fell in love with the country. 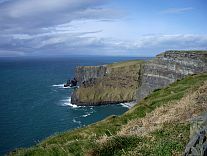 They celebrate this love of Ireland by offering a great value for money tour of one of Irelands most scenic and interesting areas. The tour was €30 for an eight hour journey packed with beautiful scenery and well delivered and informative commentary along the way. Ample stops gave us plenty of opportunity to stretch our legs and avail ourselves of the many photographic opportunities. This was largely due to everyone on board being conscientious of alloted times at each venue, so keep that in mind if you take such a tour. One of the great things about this tour was that they picked us up and dropped us off at our hotel doorstep (we stayed at Bunratty Shannon Shamrock Hotel), and were very punctual. 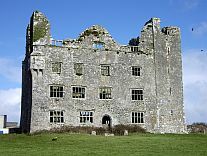 After picking us up at our hotel, the tour proceeded towards the Burren, our first sightseeing destination being Leamenagh Castle, built in 1490 and famous for the legend of Maire Rua (Red Mary) who killed her husband. The castle and the church lie on private properties and it's possible see them only from the roadside lest you want to brave eloctrocution from the electric fence the current owner has erected! Leaving the castle, we head towards the Burren. Not knowing what to expect and knowing only that it is famous for its landscape, we are quite thrilled when we catch our first glimpses of the Stony Place, which is the translated meaning of Burren. Who would have thought that rocks, bush and shrubbery could be so captivatingly enchanting and beautiful. 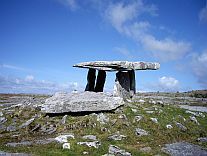 There is a mystical aura to the Burren, and no wonder, as it is steeped in ancient Celtic atmosphere and history. After cruising through the Burren and enjoying the scenery, our next stop was at Carthair Chonall, an ancient fort built by the Davoren clan. These ancient forts were built by farmers to protect their livestock and cattle, and Cathair Chonal is perhaps the best preserved in all of Ireland. There is a visitor center at Cathair Chonal, a guided tour being €6, while a self guided tour is €3.50. There is also a cafe where you can get a snack and hot drink, which came in very handy on this day. We opted for the self-guided tour which is aided by a map of the fort and an audio visual presentation which gives some interesting insight into both Cathair Chonal and life in the Burren itself. Let me mention that when we began our journey this day, the weather was remarkable, a beautiful bright sunny day, and looked to remain so. We entered the small stone building where the audio visual presentation takes place, and on exiting 10 minutes later, it was snowing. We retreated to the cafe, and 20 minutes later the sun was shining strongly once again. Typical ireland, we experienced four seasons in a half hour! Our total time spent at Cathair Chonal was one hour, after which everyone promptly boarded the bus and we headed off towards Poulnabrone Tomb. Poulnabrone is probably the best known example of a portal tomb in Ireland. A portal tomb usually has two imposing 'portals' or entrance stones, flanking the front of a rather small rectangular chamber. The capstone which rests just on the end stone and on the portal stones is large, weighing about 2 tons. Here at Poulnabrone the unburned remains of between 16 and 22 adults and 6 juveniles, including a newborn baby were recovered. 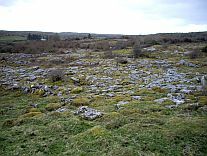 It is estimated that the majority of the adults died before reaching the age of 30 while only one lived past 40 years, which is easy to believe considering the inhospitable nature of the Burren. We only spent about 20 minutes at Poulnabrone, which was ample, and headed off towards Galway Bay and the tiny village of Doolin for lunch. Towards the end of the Burren the views of Galway Bay were breathtaking, and one could see evidence of how the landscape was sculpted by glacial movement. the drive along Galway Bay to Blackhead was as equally scintillating as anything so far, providing stunning views of the shoreline and Aran Islands. Due to the fact that everyone was mindfull of time, we were gifted several extra stops for photos. It pays to be punctual! We had an hour for lunch in Doolin, and decided on O'Connors Pub, recommended by Richard. The food was good, the Guinness fine, but I recommend grabbing a table and ordering your food immediately, as an hour goes by very quickly. An alternative is to pack your own lunch if possible, which will give you more time to explore Doolin and its surroundings. Its a tiny village full of character renoun for its traditional Irish music. Leaving Doolin we headed for the Cliffs of Moher, which didn't disappoint! Though the sun had made a full retreat by this time, the views were spectacular. A sense of peace and awe cannot be helped when viewing such of natures gifts, and I could have stood and admired the cliffs for hours. I always wonder, when I see these places how the very first people to come upon them must have felt. 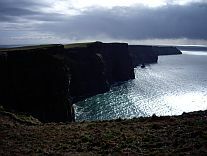 The Cliffs of Moher are truly awe-inspiring and spiritually invigorating. We spent about an hour and a half at the cliffs and headed back towards Limerick. I must say that this tour was money well spent, and highly recommend it if you are in the Limerick/Shannon area. Richard, as I'm sure Chris is, was a gracious and informative host, the bus comfortable and the time really flew by. The Barrets also provide bottled water for €1 and disposable 24 exposure cameras for €4, very reasonable prices for Ireland. Four thumbs up from us for Barret's Tours! Daniela and I try to do several Irish tours per month, so please keep coming back to see where we've been lately. If you like, subscribe to our RSS feed in the orange window beneath the navigation bar to recieve automatic updates on our latest Irish tours! Even if You Have Less-than Average Genetics... Even If You've Never Succeeded at Losing Weight Before... Even If You Have Stubborn Fat Deposits That Don't Seem To Budge... Right Here on This Web Page You've Found The Fat Loss Success System You've Been Looking For! Burn The Fat, Feed The Muscle! Check Out Our Irish Recipes to Make Sure You Sample Some Authentic Irish Food on Your Irish Tours!